Brooklyn Nine-Nine: New network, the future of the Halloween heist, and maybe more Gina Rodriguez? 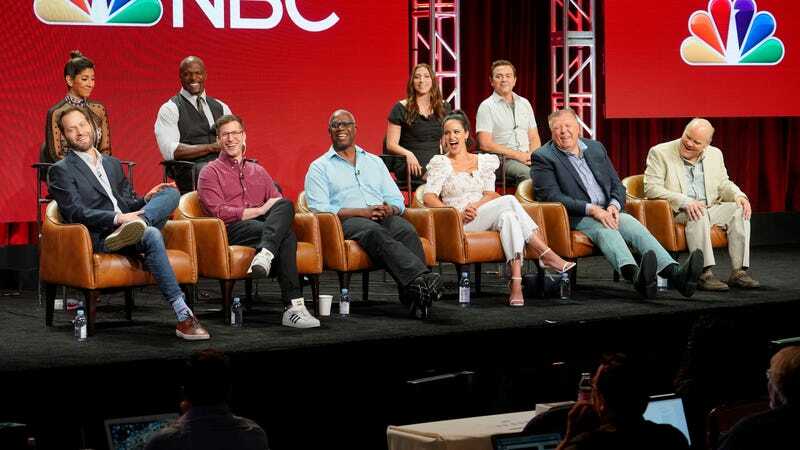 It’s been more than two months since NBC stepped in and picked up Brooklyn Nine-Nine for a sixth season, but plenty of questions remain about the sitcom’s transition to its new network home. If the show premieres at midseason, how will it be able to stage the Halloween heist? Will Gina Rodriquez return to romance Rosa Diaz? And now that the show live on beyond Jake and Amy’s wedding, what type of scintillating scenes will we see from the Peralta-Santiago marriage? Answering the last of those questions for members of the Television Critics Association today, Andy Samberg joked “Really small, detail-oriented storylines about their finances.” “Gosh, that day that they combine their bank accounts is going to be a big day,” his co-star Melissa Fumero added. Timing is also a factor for potential guest castings, be they famous fans like Mark Hamill who contributed to the social-media outcry over Brooklyn Nine-Nine’s cancellation, or Gina Rodriguez, who arrived in the fifth-season finale as Alicia, the ride-share driver who struck up a connection (and a Color Me Badd needle drop) with Stephanie Beatriz’s Rosa. Goor said they’re in conversations with the Jane The Virgin star, but the production of that show’s final season is a complicating factor. Stay tuned to find out if Brooklyn Nine-Nine comes down with a big ol’ Wiest infection.